Keeping your van and tow vehicle in contact with the road is a very desirable thing. 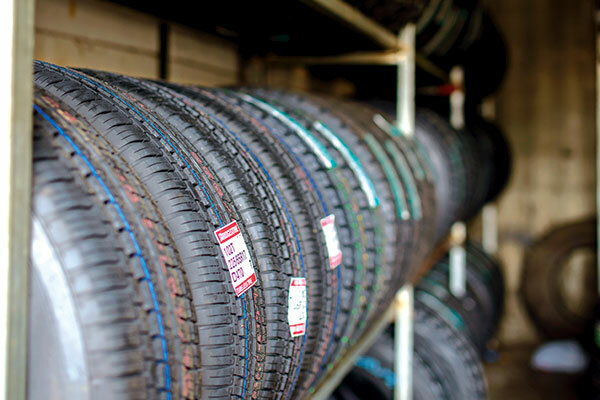 As your caravan tyres are the only things that directly connect your caravan to the road, they and the wheels on which they ride are very important, despite sometimes being taken for granted. While it’s very nice to have caravan rims that match your tow vehicle, load carrying capacity (otherwise known as load rating) is key. 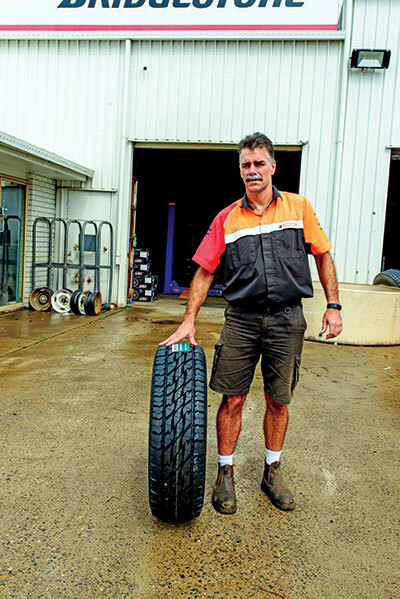 Dave Martin, the local manager for Beaurepaires Burpengary, says you need to make sure your van rims have a sufficient load rating for your van, are suitable for the van's axle configuration (single or dual axles), and are matched with the correct light truck tyres. He says the days of just ‘getting a rim and tyre and bolting it on a van’ are over. He warns insurance companies will reject an accident claim if incorrectly rated rims and tyres are used. And the attitude of insurance companies underscores safety issues. Using a rim that doesn’t have a sufficient load rating will cause the wheel studs to crack or the rim will buckle. Dave explains the load rating of the rims must take into account the Aggregate Trailer Mass (ATM), where the Tare weight plus the maximum allowed payload is divided by the number of wheels on which the rig rides. In case you’re wondering, Dave recommends CSA steel and alloy rims. He says they’ve been in Australia for a century and are Australian made. His second choice is either ROH or the Infinity range because he says “they meet the Australian Standards”. David claims imported rims don’t balance properly as they arrive with small buckles in the wheels and are too light. 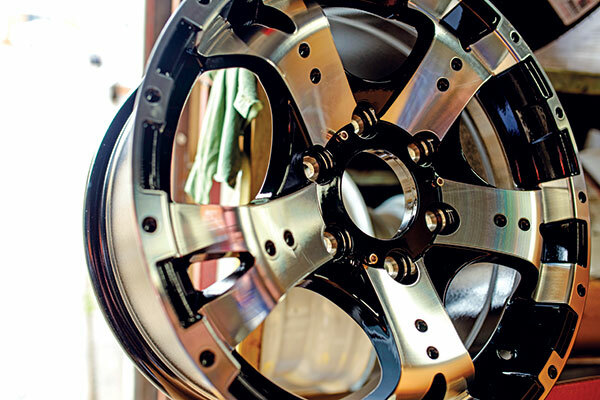 When it comes to deciding between steel or alloy wheels, he says buyers needn’t worry, as “some alloy rims are stronger than steel”. 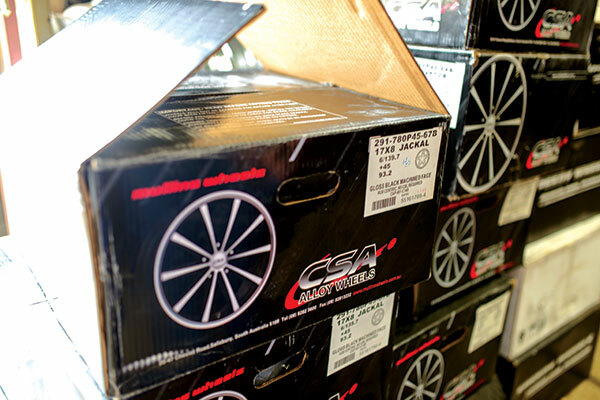 When it comes to high load-rated rims David recommends CSA Monster or Jackal ranges as they’re rated at up to 1250kg with CSA’s Renegade coming in at between 1150kg and 1250kg. That sort of load rating means a load carrying capacity of around 2500kg on single-axle or up to 5000kg on a dual-axle rig. David says load rating considerations make rim choice as important as tyre choice but a lot of people don’t take rims as seriously. They might decide on matching the rim of their passenger car rather than selecting a suitable rim for the weight of the van. That puts a lot of stress on the rims. 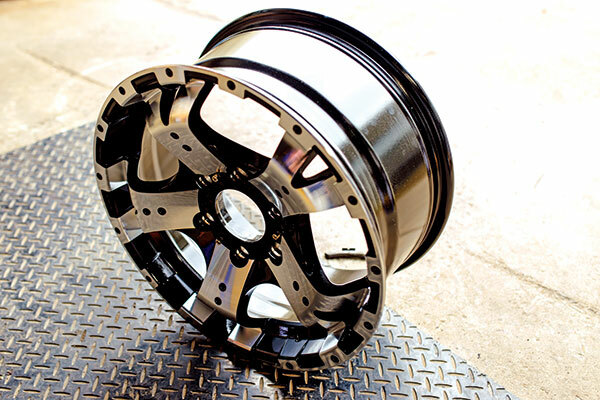 Beyond that, buyers need to be aware of the something called the rim offset. The offset determines how the rim will sit in relation to the chassis on a particular wheel hub. Simply put, if you don’t choose rims with the right offset, your van tyres might track slightly outside or inside of the tow vehicle’s wheel tracks. That will make the going harder when rattling through the rough stuff when you’re offroad. He says the best option is to fit the same hubs to your van as you have on your tow vehicles – and then everything will match perfectly, providing absolutely interchangeable wheels between van and SUV. 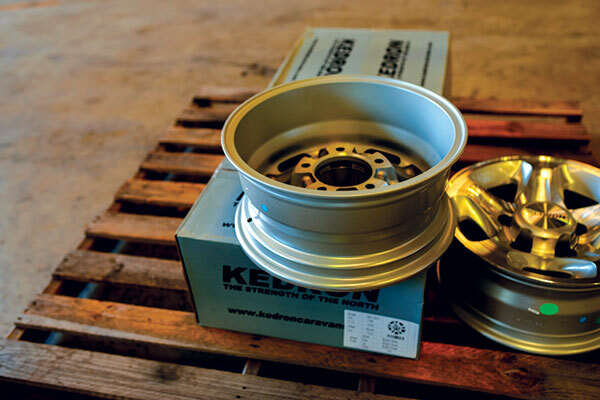 Some manufacturers like Kedron provide tailor-made rims for their caravans with appropriate load ratings. Kedron can its rims to popular tow-tug hubs. In this case, a little knowledge will not only keep you riding along the road longer, it just might keep you out of hospital or potentially stay your membership with the eternal choir-invisible for a little longer. First, always make sure the tyre pressure is correct for the caravan load, check the tread wear indicators and rotate your tyres every 10,000km, and look out for excessive road damage and cracks in the surface. When it comes to caravans, checking tyre pressure is more important than it sounds. To ensure your tyres at the right pressure for the load they’re carrying, try weighing your loaded van with its water tanks and gas bottles full and all other gear on-board. This weight is also important when selecting new tyres because every tyre has a certified load rating that you should not exceed. More on that later. Age catches up with everybody and everything. Tyres are no exception. When a tyre is too old (six years or more) replace it. You'll find the date code engraved on each tyre. We all need a little balance. To prevent undue vibration or shimmy, balance your tyres annually, every time they’re fitted, repaired, or at the first sign of shimmy and vibration. Unbalanced tyres can shorten tyre and suspension life. Understanding the information marked on the sidewall of your tyres is key to knowing how to care for them and whether or not you are using a tyre that’s right for your caravanning needs. It also helps you decide which tyres you should buy in the first place. The most important information on the sidewall of the tyre looks something like 205/65 R15 95V. It’s a code but you won’t need a cypher to decrypt it. The “205” refers to the width of the tyre in mm. The next part “65” is the aspect ratio of the tyre's sidewall and its tread rim, shown as a percentage. The “R” stands for “Radial” and “16” is the diameter of the wheel rim in inches. 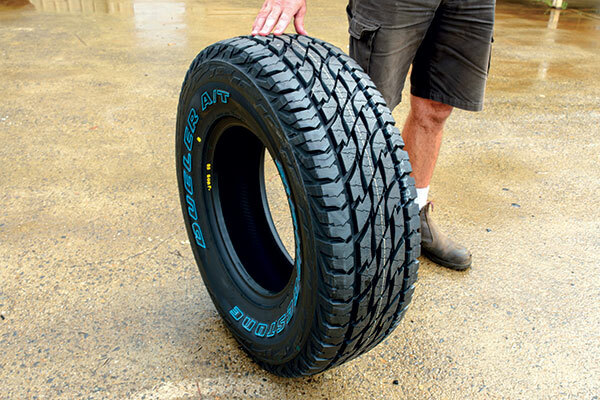 A light truck tyre will have the letters “LT” or “C” (Commercial) as either a suffix or prefix to the tyre size. After the tyre size is the service description (i.e. “95V”) this specifies load index and speed rating. “95” is the maximum load capacity of the tyre and the “V” indicates the maximum speed capacity. Commonly, tyres will have the maximum load rating in kilograms and maximum inflation pressure moulded into the sidewall in smaller text. Exceed the load rating and your tyres will perform poorly or even fail. Exceeding these limits means you’re also driving an overloaded rig and your insurance company might not smile favourably on you in the event of an accident. The lesson is simple, don’t be the schmuck who thought it wouldn’t matter or he wouldn’t have an accident. In the main, caravans are not used every day and sit in the same place perhaps for months and that can damage tyres. To solve this, either whip your tyres off and put your van up on blocks or regularly check the tyres for cracks, check the pressure and rotate them to avoid developing flat spots. expert Chris Goddard from Cruisemaster for some advice. Chris reckons you can’t select a tyre for your van based on how well it lasted on your tow vehicle. Tyres wear differently on tow vehicles and caravans and between different brands or models of vans.